The record store at 4526 Liberty Avenue in Pittsburgh's Bloomfield section sure had a good 40-year run, despite seeming so out of place among the Catholic churches, laundromats, bars, pharmacies, and pizza shops in the little Italian neighborhood. In 1979, Jim's Records, immortalized in Debt Begins at 20, moved from a smaller location just down the street into the building vacated by Michael's Shoes, followed by Paul's CDs (1994-2012), Sound Cat Records (2012-2016), and finally Juke Records (2016-2019), always with the same posters decorating the walls that Jim had hung up way back when. Jeff, the owner of Juke Records, decided to close the store rather than sign another lease, citing a lack of customers. Whatever happens with the building now, I'd be surprised if it housed another record store. With the closing of Juke, I feel like the citizens of Brooklyn must have felt when the Dodgers moved west and Ebbets Field was torn down. I was a frequent shopper at Jim's, having spent so much money there that I could have claimed Jim as a dependent on my tax return. After Jim sold the business, I didn't shop there as much, so unfortunately I'm afraid I'm one of the guilty parties partially responsible for the store's closing. I still liked the store just fine and each owner seemed like a good guy, carrying on the tradition of knowledgeable people behind the counter. When I didn't shop there it was more a matter of time and convenience. No matter what obscure band I came across via these avenues, it seemed that Jim had their record in stock and knew everything about them. The scene in Debt Begins at 20 where Bill Bored walks into Jim's played out in real life for me many times. I would walk in and trade a bunch of old records that I thought were good but now sounded like crap against this "new music" and ask a question about a new band and receive a thorough, cogent reply. For a couple years in the early 1980s I had a summer job downtown, around the corner from a National Record Mart, where I once overheard a clerk direct a woman to the country music section after she asked him where she could find the Righteous Brothers. (Correct answer: The actual Righteous Brothers couldn't be found anywhere in Pittsburgh, while their records were properly stored in the pop music section.) I found myself answering more questions than the employees there. (Yes, little girl, the Beatles were the band that Paul McCartney was in before Wings.) Until Jim's came along, the idea that a record store would have personnel that actually knew what they were talking about was a foreign concept to me. Shopping at Jim's was much like going to the Banana. You never knew what you were going to get for your money but you had to take the chance because it was the only way you were going to hear certain bands and more often than not the experience was rewarding. I had little patience for friends who wouldn't risk a few bucks on a band because they "never heard of them." I still have just about every record I bought at Jim's. Many of them bring back a memory about how I came to acquire it. One band that I wouldn't have known without WYEP was the Human Switchboard. I'm eternally grateful that I could grab Who's Landing in My Hangar? at Jim's. There were also many occasions where I was present and heard something good on the turntable and ended up buying it on the spot. One such occasion I remember was walking in and hearing "Little Girl Blue" from the Tail Gators' Mumbo Jumbo album, a swamp rock number with wild accordion and tortured fiddle solos, purchased by me that instant. Other times there would be records displayed prominently, for good reason I thought, so I would end up checking these out as well. Ever buy an album solely because of the cover? I bought Ray Campi's Rockabilly Rebellion for that reason. It was visible behind the counter for what seemed like months in 1979 and you couldn't miss it every time you checked out. The photo of Campi, older than we were but not what I would consider "old" today, big smile, heavy bags under his eyes, "riding" a big, lily-white upright bass, intrigued me. I imagined he was a rockabilly veteran who toiled in smelly southern dives for decades, never making more than $12 a week, ready to finally cash in now that all these punk kids were into Eddie Cochran and Gene Vincent. What the heck, I enjoy both rockabilly and a good rebellion, so eventually I picked it up, and it did not disappoint. Early on it seemed that the debut albums of Elvis Costello (My Aim is True) and Joe Jackson (Look Sharp!) were hot items there. There was Elvis, thick-rimmed glasses, skinny tie, and pigeon-toed stance, looking more like an accountant than an emerging rock star, and Jackson, short hair, a skinny tie of his own, angry, through his music seemingly telling off everybody who I encountered in my young life and thought deserved to be told off. The success of these two gentlemen struck me as a victory for nerds everywhere. I remember reading a detailed two-page article about the Residents in a fanzine called P.T.A. I showed the story - which told of the band recording an album called Not Available to be released after they had forgotten about its existence and their subsequent sudden disappearance - to friends who thought it was fiction until I told them otherwise. Sure enough, I was able to grab Meet the Residents at Jim's. To say the least, it was different. There were imports that weren't in the other stores. I was able to own the UK version of the Clash's eponymous debut album two years before it was released in the US with slightly different tracks and, oddly, a rerecorded version of "White Riot." I was also happy to get the UK edition of Sandinista! a couple weeks before its US release. I don't care what anybody says, I like that album. 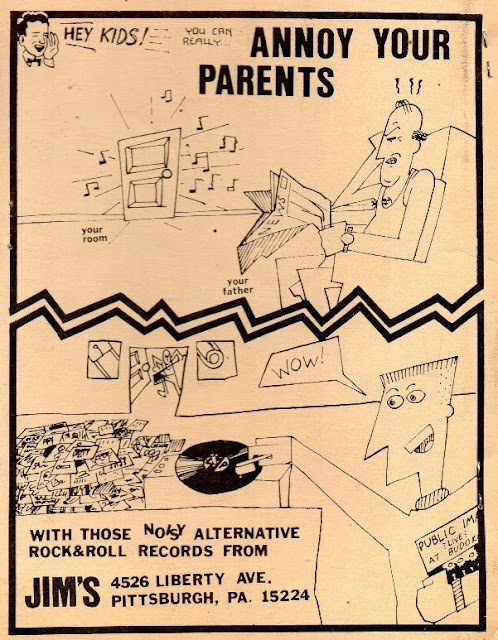 Did any of your parents ever to go into Jim's Records? My Mom did. I endured many of Dad's dinner table rants about how the Beatles ruined the world but Mom was different. Mom was only 20 years older than me, an artist, more liberal about certain things than she might have cared to admit, liked the Beatles and eventually Mirror Moves-era Psychedelic Furs, and encouraged her offspring to enjoy music and use their own creative or artistic talents (grossly overestimating mine). One year she asked for my Christmas list. At the time I didn't give a crap about anything other than music and baseball - OK, so I haven't changed much in 40 years - and figuring she wouldn't get me season tickets for the Pirates, I gave her a list of albums that included Squeeze's Argybargy and Rockpile's Seconds of Pleasure and told her that she had the best chance to find them at Jim's, never expecting that she'd actually ever wander in there. She did, and she said that the "kids" who worked there were polite and helpful. Maybe it made her feel better about the time I spent at the Banana. There was a period of time when the bag of records one took home from Jim's included a flyer with information about upcoming releases, staff picks, and the like. One of the staff recommendations was Tidal Wave by Frankie Paul. I didn't know anything about Frankie Paul and still don't. But I was always looking for some good reggae and this album remains a favorite. I also recall the guy who walked into Jim's raving about "the Shoes." He wore a paisley shirt and pointy shoes, so I figured he knew what he was talking about. I read up on the band a bit, found they were known simply as Shoes, and purchased Present Tense, beginning a lifelong love affair with the Shoes - er, Shoes. I'll conclude this combination trip down memory lane/disjointed narrative with the tale of the last album I purchased at Jim's, of all things, In the Dark by the Grateful Dead. I grabbed one from the fruit crate that served as a bin at random without looking at it closely. When I got to the counter, Jim said, "You've got the rare 'upside-down eyes' album cover." Very cool. The last record I bought there was a collector's item. Articles on the Post-Gazette Newspaper Archive get bigger when you click on them. Jim Spitznagel and His Legacy on LibertyAvenue. Comprehensive interview by Mind Cure Records in 2013. A Groove All Their Own (Pittsburgh Press, 7/19/85.) Independent record stores thriving in Pittsburgh. Jim's Records is featured at length. Continued here. Spinning a New Career (Pittsburgh Post-Gazette, 1/2/94.) From Jim's Records to the Warhol and the end of an era. Continued here. WHY IS THIS MAN BUYING A RECORD STORE? (Pittsburgh Post-Gazette,4/5/12). For the love of it, of course. Paul's CDs becomes Sound Cat Records. Continued here.